GLOBAL AWARENESS 101 - Let your VOICE be heard and get involved. OUR future depends on it! : Pisces New Moon Solar Eclipse Is Sunday February 26th by Lena Stevens and Patricia Liles at PowerPath. Pisces New Moon Solar Eclipse Is Sunday February 26th by Lena Stevens and Patricia Liles at PowerPath. Our second eclipse this month, bookending a very potent time of Change. Take some time to reflect on Change and how it has moved energy for you this month. Where might you still feel stagnant and unmoving? What are you still attached to? What is causing you grief right now in your life? Relationships? Work? Health? Projects? This eclipse/new moon day provides an excellent container for a permanent shift and turning point for something in your life that needs a major change. Look truthfully at your life and commit to living in more love and compassion. It is not useful to feel guilt, remorse, blame or judgment. Just get out a paper and pen and rewrite your intentions and recommit to the changes you know you need to support. And remember there is great freedom in cutting something loose that no longer serves. Boundaries and limits are dissolving on every level imaginable under the auspices of Pisces, the final sign of the zodiac before we begin again at the vernal equinox. Endings and Beginnings. An eclipse at this New Moon puts it all under a magnifying glass so you don’t miss the detail or the perfection of life unfolding. Pisces that most watery of water signs ruled by Neptune, God of the Oceanic World, is symbolized by two fish swimming in opposite directions representing our “self undoing or self sustainment”. The self-undoing is expressed through our addictions, our negative head talk, our anesthetizing our self in so many creative ways, getting lost and confused, forgetting we can never be separate from Spirit. Our self-sustainment comes from the ability of Pisces to open the heart beyond personal love to compassionate love and unity with all, like the vast ocean so many drops, yet a vast living, connected entity. 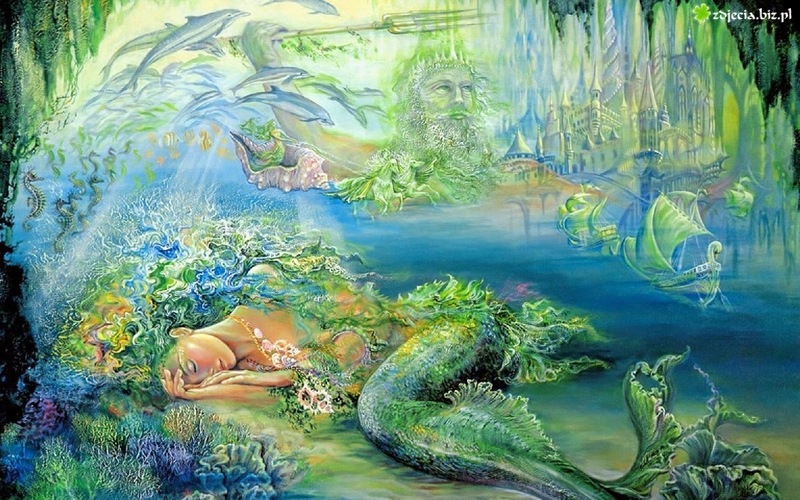 Pisces’ gift of boundarylessness is our link to intuition, empathy, imagination, poetry, telepathic connection ~ all those powers of the heart that know no limits and are sourced from spirit. You can’t have an eclipse unless the Sun and Moon are aligned to the North or South Node. The Nodes are not a planet, but the point were the Sun, Moon and Earth orbits intersect ~ magnificent alignment. These are the points of growth (North) and the skills and lessons we bring forth from the past (South). The Nodes stay in a sign for about 18 months and the eclipses occur along that axis. This South Node eclipse marks the ending of the Virgo/Pisces cycle as we shift into the new Leo/Aquarius cycle that was initiated during the last lunar eclipse two weeks ago. The ‘Great American’ solar eclipse on August 21 will also be in Leo and will be visible all across America from Oregon to the Carolinas. I already have dibs on my spot in Oregon. With this last eclipse in Pisces, we let go of one more level of the spiritual burden laid on us that we are fallen or sinful, unworthy, unclean in our enjoyment of our bodies, undeserving, less than… who made that #!$# up? Never mind, blame and resentment are the games we were driven into by those convinced we were separate from our divine nature. Not any more! And this final eclipse in Pisces is a grand opportunity to root out and dispose of those beliefs as outdated and not useful in the new, chaotic times of transition. We have Sun, Moon, Mercury, South Node, Neptune, Chiron, and Pallas Athena all in Pisces ~ that’s a full house. Powerful Neptune, ruler of the chart, connects us to the collective unconscious. Conscious beings (you) are being called to let the old dissolve, forgive those unable to embrace swift change (maybe yourself), surrender to trust in Spirit even if your knuckles are bleeding. Surrender is your ticket into playing the crucial game you signed up for ~ learning to trust Spirit, your intuition, your heart, trust in the goodness of others. Mars is in its own sign, Aries, free to be its fiery, aggressive, pioneering self, fueling action through desire and passion, anger and competition. But his biggest thrust is how he will trigger the T-Square of Uranus, Pluto and Jupiter. That means Mars’ fiery, action-oriented energy will be stirring the pot of change, revolution, evolution and expansion and while we may see Mars in his role as the Divine Masculine, we may also see some darker manifestations of his power as well – explosive, confrontational, self-serving, impatient. Best to have your tools ready to channel that level of heat and work it to fuel your big desires and plans. Fire works best when it’s properly contained and directed and not let to run rampant and unchecked. All sorts of sexual issues might jump out of the bag as asteroid Vesta keeper of those kundalini energies gets in touch with some of that deep feminine rage that needs release as Vesta completes the T-Square creating a Grand Square known for its stressful, but also dynamic energies. The thing about Mars, he gets everything out on the table like it or not. The purposeful Lord of Karma, Keeper of Time, our Teacher, master of the physical plane is making a significant and masterful journey through the Galactic Center – that’s the black hole that our Milky Way Galaxy spins around. The center is at 27º Sagittarius and Saturn is beginning an extended pilgrimage through this rarefied area lasting all year exact on March 8, May 6 and November 25, 2017. It’s current and first pass will last nine weeks. I remember in 2007 when Pluto made this same journey through the Galactic Center at 27º Sagittarius. It’s a time of unfathomable mystery where the planet downloads a whole new encoding of frequency. We have been evolving at unprecedented, break-neck speed ever since. Pluto changed signs to Capricorn in November 2008 as Obama was elected, and in 2012-2016 the seven exact squares of Pluto and Uranus brought to the foreground intense social-political evolution and revolution that we are still in the valence of. Pluto’s passage through the Galactic Center initiated massive shift. What will Saturn’s journey reap for us in the next year? New discipline, taking responsibility for creating our own realities, grounding our spiritual experiences into this physical plane, creating stronger containers for our increased consciousness, defining a new age and new rules as Saturn enters Capricorn and begins a whole new era at the end of 2017 having visited the sacred center of our galaxy. The last time Saturn passed through the Galactic Center 29 years ago was just after the Harmonic Convergence in 1987 the significant first gathering of global meditation and intention based on aspects of the Mayan calendar that hundreds of thousands of people participated in all over the globe. Venus is about to undertake a major journey herself where she begins to relinquish her place as evening star in the western sky, retrogrades, eventually meets the Sun (March 25) becomes lost in that brilliant light and emerges miraculously as the morning star in the eastern sky. On March 4, Venus retrogrades in Aries and we begin a new Venus cycle. A new ten-month Venus cycle that begins in Aries is likely to host an adventure and journey to find out just who ‘I Am’, the Heroine/Hero’s quest. Our self-awareness will blossom and we hold the potential to give birth to some courageous, independent acts of beauty – barriers will be broken! The feminine is exuberant and assertive! Think Jane Fonda, Elizabeth Warren, Bernie, Beyonce ~ they all have Venus in Aries. You are what you make of your own life with this cycle. With this New Moon cycle augmented and punctuated by eclipse, we choose how we will surrender and what we will release. During this final Pisces solar eclipse, the Nodes lead us to leave the yin earth/water realms of internal growth and soon step into the yang world of showing up and seeing a larger bird’s eye view of our world. With the emphasis on the final sign of the zodiac, we can choose to access the collective pool of fear and separation or the collective pool of unity and creativity. It’s a glorious time to be conscious and alive!